The antiques glossary – antique terms r covering everything from ramsden to ruskin. Here you will find antique related words or antique terms begining with ‘r’ covering everything from ramsden to ruskin and many more that you might find useful. The internationally acclaimed english textile and furniture designer, whose work combined the traditional with the modern.is probably best known for his comfortable and ingenious chairs. His most successful design was the ‘B.A.’ chair (1945), made of resmelted aluminium alloy from wartime aircraft scrap. The chair was introduced at the ‘Britain Can Make It’ exhibition at the Victoria and Albert Museum, London, in 1946 and won a gold medal at the 10th Milan Triennale in 1954. It was in constant production until 1969. A combined wireless set and gramophone with a single built in, loudspeaker. Popular in britain from 1930-1960. Now collected by enthusiasts. Chelsea porcelain mark. In this period, the paste and glaze were modified to produce a clear, white, slightly opaque surface on which to paint. The influence of Meissen, Germany is evident in the classical figures among Italianate ruins and harbour scenes and adaptations from Francis Barlow’s edition of Aesop’s Fables. In 1751, copies were made of two Meissen services. Chelsea also made figures, birds and animals inspired by Meissen originals. Flowers and landscapes were copied from Vincennes. A technique for making metal hollow-ware. A flat disc of metal is hammered over an anvil type stake to gradually raise the sides to the required shape and depth. 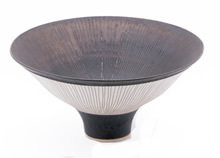 A porous Japanese pottery with a thick lead glaze, in colours ranging from dark brown and light red to straw, green and cream. First produced in the 16thC, and closely associated with the tea ceremony. Still used in Japan today. English silversmith born in sheffield and associated with the arts and crafts movement. Ramsden specialised in the design of silver and gold presentation and ceremonial pieces, including plates, wine cups and masers. In 1898, he established a london workshop with silversmith Alwyn Charles Elison Carr, who produced his designs. 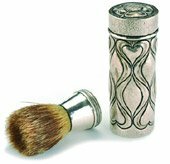 Together they produced handmade, arts and crafts and celtic-style objects in silver, pewter and wrought iron. Carr left the workshop in 1918 and Ramsden continued producing art deco silver. Sets of identical small tables that can be fitted together to form one large table,. Popular in the late 18th and early 19th centuries. Style of pottery decoration, originating c1500 in Faenza, Italy. Popular in the 16th century, and where paintings comparable to Italian Renaissance paintings were applied to maiolica ware. The subjects, biblical, historical, and mythological are executed with a true realism, including the use of perspective. 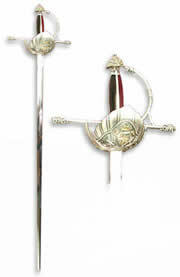 A sword consisting of a metal blade, longer than a dagger and fitted with a handle or hilt equipped with a guard. Designed for thrusting rather than slashing or cutting. usually with an elaborate hilt and bar or cup to protect the hand. A speciality glass used for drinking ratafia, an almond and fruit liqueur. Flute shaped and popular in the 17th century, cordials were often taken from miniature wine glasses measuring 4-6 inches in height.The flute cordial is often termed a ratafia glass. A mark on postage stamps indicating the rate of postage to be recovered from the recipient; a device used before the introduction of the fixed rate penny postage in 1840. See cane work and Antique Rattan Furniture Collectors – 1870s to 1930s. British glass-maker who in 1673 was employed by the London Glass-Sellers’ Company to produce a home-grown rival to Venetian cristallo. Initially his new flint glass was subject to grizzling, but by 1676 he claimed he had overcome this, and was allowed to impress his products with his own seal in the shape of a raven’s head. Although the problem was far from resolved – all known sealed pieces have since deteriorated – and Ravenscroft is no longer credited with the invention of lead crystal, he did produce some of the finest vessel-glass of the time. Eric Ravilious is now one of the most popular artists of his period. He was a painter of watercolours and murals, a book illustrator in wood engraving and lithography, and a designer of transfer-ware pottery. His best known designs were for wedgwood pottery. He applied a dry and precise style of working to imaginative and romantic subject matter. From 1940 he was an Official War Artist, painting memorable pictures of ships, aircraft and coastal defences, until his tragic death in a flying accident off Iceland in 1942. Chair fitted with a small, adjustable surface on which to rest a book. The bookrest on 18thC examples was attached to the top rail on the back of the chair, and the occupant sat astride the seat, facing backwards. Mid-19thC reading chairs had swivel bookrests and candle brackets fitted to the arms. There are also small tables with adaptations for reading, such as a hinged top that can be angled. A late Victorian version has revolving book trays on a supporting pillar. The Recoil escapement is so called as at the very end of the pendulum’s arc, the escape wheel actually moves backwards a tiny amount. Recoil escapements are adequate timekeepers, and have the distinct advantage that they are somewhat "forgiving" of errors in construction or alignment of the pallets. They are commonly used on low-cost clocks, and are popular with modern clockmakers. Many modern clocks use a variation of the recoil escapement, where instead of a solid anchor a bent strip of metal is used. These anchors are less accurate than the solid, but much easier to adjust. Chelsea porcelain mark. In the red anchor period Chelsea porcelain became a more consistent creamy-white. Although Meissen themes such as commedia dell’arte figures are apparent, the Chelsea factory developed its own distinctive style and reached its peak in artistic design, (See: Chelsea Porcelain Marks and the Chelsea Anchor Marks). Botanical painting and tureens modelled in the form of birds were outstanding features. Kakiemon (Japanese pottery), subjects were popular from the late 1740s until around 1758, inspired by the original Japanese and then by Meissen and Chantilly. Some English-inspired tableware decorated with botanically accurate plants, copied from The Gardner’s Dictionary (1752) were also produced in this period. Spinel is the great imposter of gemstone history: many famous rubies in crown jewels around the world are actually spinel. The most famous is the Black Prince’s Ruby, a magnificent 170-carat red spinel that currently adorns the Imperial State Crown in the British Crown Jewels: Henry V even wore it on his battle helmet. The Timur Ruby, a 352-carat red spinel now owned by Queen Elizabeth, has the names of some of the Mughal emperors who previously owned it engraved on its face, gving it an undeniable pedigree. Spinel is a durable gemstone that is perfect for all jewellery uses. It is most often faceted in oval, round, or cushion shapes and is not usually found in calibrated sizes due to its rarity. Unglazed fine stoneware made by adding ground burnt flint to the clay paste for extra hardness. It was produced in the 17thC in yixing, China, and in the early 18thC by Böttger of meissen in experiments to make porcelain. It was widely used in Staffordshire potteries during the 18thC for vases, teapots and ornaments. Decoration included sprigging in white or black slip. A later refinement was wedgwood’s rosso antico in the 1760s. 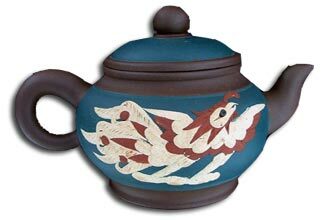 Chinese red stoneware particularly in teapots were exported to europe in the 17thC. and inspired similar wares produced by meissen and by the Elers Brothers in England. The converse of fluting – a relief decoration of parallel, convex ribs, or reeds. The modern term for the predominant table design of the 15th to 17th centuries. Also known as joined or long tables, they are usually of oak and the top is joined to a fixed frame. Sturdy legs at the corners are linked by stretchers which doubled as footrests to avoid contact with cold stone floors. Refectory tables were common kitchen and farmhouse furniture until the 19thC. 19thC rings and brooches set with gemstones whose initial letter spells out a word. ie; regard – Ruby, Emerald, Garnet, Amethyst, Ruby, Diamond. This acrostic theme was also used for personalised jewellery in which the wearer’s name was spelt out. French style covering the regency of Philippe d’Orleans (1715-23), although evident c1710-30 – the beginnings of the early georgian period in Britain. It was lighter and less formal than the preceding Louis XIV style, and marked the beginnings of Rococo taste in France. General term for several furniture and decorative styles found in 1800 to 1830. It was named after the Prince Regent (later George IV), who ruled for his father 1811-20, although it was established before and continued for a decade or so after this period. Marks in seal or script form on Chinese porcelain, giving the name of the emperor and usually the dynasty. Gradually, it became commonplace to mark a piece not with the current ruler’s name, but with an earlier emperor’s nien hao, or mark. This was sometimes out of respect to a previous period, sometimes to avoid punishment for the prohibited use of the reigning monarch’s name on wares not intended for his own use. As a result, imitations far outnumber genuine reign marks. Decoration that projects out from the surrounding surface. The terms bas, medium and high relief refer to the depth of the decoration. Any driving force, such as a weight or spring, in a clock or watch that is automatically rewound at regular intervals by the mainspring of the movement. This rewinding facility results in a more regular driving force than could be provided by the mainspring itself; it has a similar function to the fusee but is more effective. A remontoire or constant force escapement incorporates a remontoire device to ensure constant force between the escape wheel and the balance. Revival of Classical ideals in European art and literature from the late 14th to early 17th centuries. Craftsman responsible for joining the separately cast or moulded parts of a ceramics figure into a complete piece. A clock or watch with a striking mechanism activated at will, which tells the user the time without his actually having to look at the timepiece. Repeating devices were introduced by British clock-makers in the 1680’s and are still being made today. The mechanism is activated by a cord or lever to sound (or ‘repeat’) the last hour, quarter hour and subsequent minutes, and more rarely the last five minutes. A form of chasing on silver and other metals to provide intricate patterns and to sharpen detail. The technique involves first embossing (pushing out) the general shapes from the reverse of the piece to create a three-dimensional effect on the outer surface. The repoussé (pushed back) element comes in when the finer decorative details are added by selective pushing back of these raised surfaces from the front. The article is laid on – or if hollow, filled with-a firm yet yielding base of pitch and the design pounced or hammered in, using a wide variety of punches and other specialist tools to give different effects. Repoussé was used widely on late 16th and 17thC silver, and revived in the 19thC in Britain and elsewhere in Europe. An honest re-creation of an earlier object, as opposed to a dishonest forgery. An area on a piece of pottery or porcelain that is left free of or reserved from the ground colour, ready for a painted decoration in enamel colours. Also – The slight ridge where the ground ends might be concealed by a painted line, which also frames the design. Also – Refers to an area on textiles that is left free of colour or pattern. Also – The minimum price a seller at auction is prepared to accept. Metallic decoration, often in silver, applied to glazed pearlware (see creamware) and other ceramics in Britain from c. 1810-30. The design is painted or stencilled in wax, or some other material resistant to the lustre, and then fired. An adaptation of the French empire style from the time of the post-Revolution restoration to the throne of the French monarchy, 1815-30. Decorative wares became more brightly coloured and bois clair furniture, made of light-coloured woods (also known as style duchesse de Berry), was fashionable. Furniture style linked with Charles IIs reign, from the time of his restoration to the British throne (1660) until his death in 1685, or sometimes to the end of the l7thC. Pierced, interlaced or interwoven to form a net or web-like pattern. In glassware this is achieved by: engraving or cutting; by the latticing technique; undercutting an openwork net (see cage-work) ; pincering strands of glass to form a basket-weave effect; or by covering glass with, or blowing it into, a wire netting (netted glassware). In ceramics and silver, see pierced decoration. Firearm with a turning cylinder that holds several cartridges. Although some examples were produced earlier, the weapon only became common from the mid-19thC. Chair with a swivel seat. Revolving chairs existed as early as the 16thC, and adjustable-height music stools were introduced in the late 18thC. A revolving comb-back windsor chair was developed in the 1770s, and in the mid- 19thC in the USA a successful prototype with an adjustable back set the pattern for the next century. British versions were at first designed principally for invalids, but by the end of the 19thC had become desirable office furniture. A colourless quartz much used by 19thC jewellers. Also – Term often used c1900 for multicoloured glass stones. Also – Modern term for any coloured glass paste. A hard, durable silvery-white metallic element which is used to form high-temperature alloys with platinum or plated onto other metals. Many Victorian silver or gold brooches have been ‘modernised’ -and ruined – by rhodium plating to make them look like platinum. Decoration used on Oriental porcelain from the 12thC, but particularly found in 18thC and modem Chinese wares. The effect of see-through ‘grains’ is created by making holes in the body of the pot before glazing and firing. Sometimes grains of rice were pressed into the vessel walls. On firing, these burned off, and the glaze flooded the holes. Glass-makers based at Wordsley near stourbridge 1829-1930. By the 1840s, the firm was an important producer of cased, transfer-printed, and cut glass and in the 1860s pioneered new engraving machines for complex patterns. 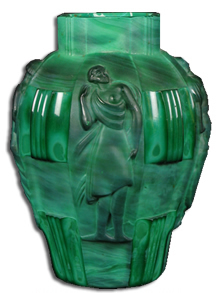 They were one of the first firms to produce cameo glass successfully in the 1870s. The firm was finally taken over by thomas webb & sons in 1930. English potter who worked at swansea and leeds potteries before establishing a factory at Hanley, Staffordshire, in 1794 with his brother George (c. 1758-1823). The factory relocated to Shelton in 1802 and produced stone china and porcelain. Job became a class leader in the local Methodists and was one of the founder members of the Methodist New Connexion in Hanley in 1797. They met at a coach house in Albion Street, Hanley until Bethesda Chapel was built on the site in 1789. In 1785 he married Elizabeth Mayer (daughter of Elijah Mayer, himself a potter). Job and Elizabeth had three sons (Joseph died as an infant), the other two sons, John and William received equal shares in the business in 1808. Elizabeth died in 1809 and in 1813 Job married a Miss Cadman of Sheffield. His sons, John (1785-1860) and William (1788-1864), continued running the factory upon his death and produced bone china tableware, garden statuary and blue and white ware. Austrian born (1902) art potter who moved to Britain in 1939 and was influenced by Bernard leach. Rie’s elegant and functional stoneware and porcelain items, often conical or trumpet-shaped in form, are covered in either a very plain glaze, or in a bubbly thick glaze of almost volcanic appearance, heightened by the use of iron oxides. The thick glazes are not unlike those of Hans coper, with whom she shared a studio for many years. (1734-1806) Among the best known and most versatile of all French furniture-makers. German-born Riesener was appointed ébéniste to Louis XVI in 1774. He used gilt-bronze mounts and marquetry extensively as decoration. 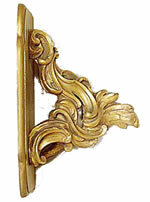 Riesener continued working through the French Revolution, removing all royal emblems from pieces of furniture, until 1801. Dutch architect-designer, the son of a joiner, who abandoned traditional methods of joinery in his furniture designs. His furniture is characteristic of the de stijl group, the Dutch artists’ association which he joined in 1919, resulting in pieces that are starkly geometric in line, rather like abstract sculptures. Natural wood surfaces are invariably painted in primary colours, the construction is deliberately left exposed, and sections are screwed together rather than joined. Following the worldwide economic depression of the 1930s, Rietveld designed inexpensive furniture typified by his crate chair, using simply cut sections of packing-case wood. Born: 1925 in Polaun, Bohemia. Died: 17 March, 2004, in Genoa, Italy, aged 79. A ninth-generation glassmaker, he was president of the world-renowned Austrian family company from 1957 to 1994, when he was succeeded by his son Georg. Soon after taking control of the business, which was founded in 1756, he began experimenting with the shapes of wine glasses. A firearm developed from the 15thC with a barrel which has spiral grooves cut into the bore – the rifling. This causes the bullet to spin, resulting in greater stability of flight and accuracy. Chair resting on curved runners (known as bends) connected to the front and back feet. Rocking chairs were introduced in the USA and Britain in the 1760s, but it was the Americans, whose attitudes and tastes were more relaxed than those of the Georgians and Victorians, who led rocking-chair fashions over the next century. A Yorkshire pottery and porcelain factory on the estate of the Marquis of Rockingham, 1745-1842. It produced earthenware similar to that at leeds and some with a treacle-like glaze, including the lidless cadogan teapot. From 1826, Rockingham made fine-quality bone china tea and dessert services, vases, and well-modelled animals and figures. During the 1830s, extravagant floral decoration appeared particularly on ornamental ware. European decorative style, a development of baroque, in the 1730s. Rococo is characterised by curving, asymmetrical motifs based on rock, shell, floral, leaf and other natural shapes. Chinese and Indian motifs are also common. Delicate carving emphasises the curving lines of furniture, and frames are swirling and elegant. 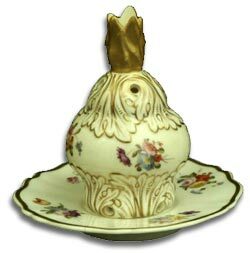 The name ‘Rococo’ is derived from the French words rocaille (rockwork) and coquillage (shellwork). The style reached its peak in Britain c1740s and 50s, and was revived again in Britain and the USA in the early to mid-19thC. The Rococo style spread with French artists and engraved publications. It was readily received in the Catholic parts of Germany, Bohemia, and Austria, where it was merged with the lively German Baroque traditions. German Rococo was applied with enthusiasm to churches and palaces, particularly in the south, while Frederician Rococo developed in the Kingdom of Prussia. Architects often draped their interiors in clouds of fluffy white stucco. In Italy, the late Baroque styles of Borromini and Guarini set the tone for Rococo in Turin, Venice, Naples and Sicily, while the arts in Tuscany and Rome remained more wedded to Baroque. Rococo in England was always thought of as the "French taste." The architectural stylings never caught on, though silverwork, porcelain, and silks were strongly influenced by the continental style. Thomas Chippendale transformed English furniture design through his adaptation and refinement of the style. William Hogarth helped develop a theoretical foundation for Rococo beauty. Though not intentionally referencing the movement, he argued in his Analysis of Beauty (1753) that the undulating lines and S-curves prominent in Rococo were the basis for grace and beauty in art or nature (unlike the straight line or the circle in Classicism). The development of Rococo in England is considered to have been connected with the revival of interest in Gothic architecture early in the 18th century. Thin stick of glass of a single colour. It is made by rolling a small gather of molten glass on a marver and then stretching it to the desired thinness. Rods may be moulded to give different shapes in cross-section (stars, hexagons, etc) but they are generally used in cylindrical form. Rods may be arranged in a pattern and fused together to make canes, cross-sections of which are used in millefiori and mosaic objects. German furniture-maker of the 18thC who specialised in sumptuous pieces, the earliest decorated with pictorial marquetry. He also used many mechanical devices in his furniture, such as built-in clocks and concealed drawers. 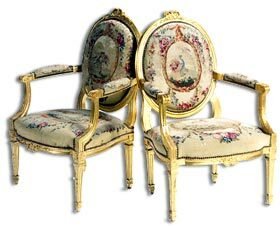 Roentgen supplied furniture to both the French and Russian royal families, but was ruined by the French Revolution of 1789-99. Watch company founded in London in 1905 by Swiss watchmaker Hans Wilsdorf (c1881-1960). The company moved to Geneva in 1920. Rolex launched the Oyster range of watches in 1926, and the Prince range in the 1930s. German businessman. Established in England then Switzerland. 1905 Founded Wilsdorf and Davis in London. Agreement with the AEGLER company in Bienne (Switzerland) to mass produce wristwatches. 1907 Founded Rolex at La Chaux-de-Fonds, trade name in 1908. 1920 Creation of the Company Rolex Watches S.A. in Geneva. 1926 Patent for a water resistant case and screw winding crown. 1927 Test of the Rolex Oyster, the first water resistant watch worn by English swimmer Mercedes Gleitze when she swam across the Channel and emerged in Frnace with the Rolex perfectly on time after 15 hours in the sea. 1931 Launch of the Rolex Perpetual, the first automatic wristwatch with a rotor turning 360° but only winds the spring in one direction. 1945 Launch of the Rolex Datejust, the first automatic wristwatch with date aperture. 1953 Launch of the Rolex Submariner, the first diving watch water resistant to 100 metres . 1956 Launch of the Rolex Day Date, the first automatic wristwatch indicating the date and day of the week in letters and in 25 different languages. 1960 A special Rolex Oyster watch fixed outside the Trieste bathiscaph went down 10916 m in the Mariannes trench in the Pacific Ocean and emerged without damage. A form of gold plating in which very thin sheets of gold of any carat value, are fused at a high temperature to a base metal such as copper and then rolled to form a sheet of the required thickness, maintaining a uniform layer of gold throughout. Rolled-gold wire is made by enclosing a base-metal core within a rolled-gold tube and drawing out to the required degree of fineness. The process was introduced in the early 19thC and applied to étuis and inexpensive jewellery. A late 18th and early 19th-century decorative technique which used tightly rolled strips of paper or card glued onto boxes, tea caddies and other small objects to form patterns. London-based huguenot silversmith who produced very large, ornate silverware incorporating much cut-card work, gadrooning and cast figurative decoration from 1705. He was commissioned by British royalty, and made pieces for the general market. A German wide-bowled, green-tinted drinking glass with a thick hollow stem often decorated with prunts, atop a coiled foot. It was developed in the late 15th to early 16th centuries, but reached the height of its popularity from the late 17thC to c. 1825 and was widely copied throughout Europe. It was the glass from which the British rummer eventually evolved. An American pottery company established in 1880 by Maria Longworth Nicholas. In the late 1800s Rookwood Pottery gained a formidable reputation as one of the finest potteries in the world. It was awarded a Gold medal at the Exposition Universelle in Paris in 1889 and is still producing pottery and tiles at its works in Cincinnati Ohio. German manufacturer of porcelain tablewares, founded 1879 and still one of Germany’s largest porcelain producers. Heavy, durable tropical hardwood, very dark brown with a rippled grain of near-black running through. The name comes from the fragrance released when the wood is cut. Rosewood was used for inlaid decoration in the 17thC, and as a veneer from the 18thC, but usually for small panels and for decorative banding. It was little used for the main body of a piece of furniture until the early 19thC. A related species first imported to Britain from Brazil in the late 17thC is kingwood or prince wood. It is rich deep brown but with purplish tones that give it the alternative name of violet wood. Kingwood was used as a veneer, for parquetry and cross-banding, and was particularly popular in France. See tulip wood. A type of red marble. Also – Red stoneware made from c. 1770 at the wedgwood factory. One of the first French centres, during the 16thC, for the production of tin-glazed earthenware in the Italian maiolica tradition. This evolved into French faience, for which Rouen was the most influential centre by the close of the 17thC. Distinctive decorative styles were developed, including the formal, embroidery-like lambrequin (see decorative motifs) borders and style rayonnant. Tableware, ewers and other vessels at this time reflect the shapes found in silverware; they are blue and white, but the occasional touch of red was also used during the early 18thC. By the 1720s, the full range of high temperature colours was used for Chinese-style designs in famille-verte colours, and from 1740 Rococo-style garlands and shells framing pastoral scenes were dominant. Bohemian porcelain factory founded 1860 in Dux (now Duchov,) noted for its jugendstil decorative ware, much of which was exported to the USA. Pottery and porcelain factory founded 1883 near The Hague, Holland. The most notable early products are a kind of updated DELFT-style – blue and white ware with abstract decoration. The introduction of a fine eggshell earthenware in 1889 set the Rozenburg factory apart from its contemporaries. Shapes of Rozenburg pieces are distinctive too, with attenuated AMPHORA-like vases and clean, simple lines moving from curved to flat planes. Decoration was inspired by Javanese batik designs; it included flowers, birds and foliage and was executed in fresh overglaze colours. Glass containing copper oxide, or occasionally gold oxide, to give a rich, brilliant red colour, much used for decorative vases and jugs. The technique for its manufacture was invented in the 17thC and is still used today. In Britain and other parts of Europe, a piece of carpet that is small enough to hang on a wall, or that measures up to 6 ft (1.8m) long; anything larger than this is classified as a carpet. In practice the terms are almost interchangeable. 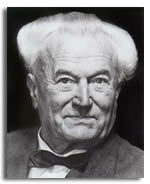 French cabinet-maker and interior decorator of the art deco era, who also designed porcelain, fabrics and wallpapers. His pre-1925 furniture was based on neoclassical forms. Later work was influenced by cubist art, and in the 1930s featured tubular steel and plastics. Large-bowled, shortish-stemmed drinking glass for long drinks such as beer and cider. Founder of Rundell, Bridge & Rundell, the most successful English firm of silver and goldsmiths in the first half of the 19thC. The firm became goldsmiths to King George III and produced a wide range of silverware for the aristocracy. A term for long, narrow Oriental carpets made for export to the West from the 19thC. Those made in Persia (Iran) are known as kenares. with flambé, mottled or monochrome glazes. Taylor also experimented with high-temperature and lustre glazes to achieve a variety of colours, textures and patterns across a wide range of products including useful wares, candlesticks, hatpins, buttons and cufflinks. The pottery remained active until 1935. Influential 20thC furniture designer and manufacturer linked with the British modern movement. His Russell Workshops in Broadway, Worcestershire, produced both his own machine-made furniture based on traditional English designs (such as ladder-back rush-seated chairs) in yew and oak, and designs by other designers such as Alvar aalto and the thonet brothers. Leather treated with an oil distilled from birch bark to make it particularly hard-wearing. It was used for upholstery in the late 17thC and throughout the 18thC in Britain and the USA.